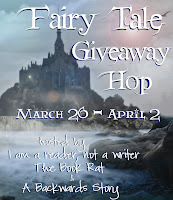 The Fairy Tale Giveaway Hop hosted by I Am A Reader, Not A Writer, The Book Rat and A Backwards Story has begun. This hop is in conjunction with the 3rd annual Fairy Tale Fortnight and runs from now until midnight on April 2nd. This is what we're offering: one e-book copy open internationally. This modern retelling of the myth of Cupid and Psyche is a fantastical journey filled with laughter, danger, and the indomitable power of love. Psyche Middleton vows her dad will never see the risqué photos she took during a summer modeling stint abroad, but one of them ends up on a billboard in her Montana hometown, where everyone—especially her dad—can see it. That becomes the least of her worries when she meets Erik, a mysterious guy who rescues her from a mob and who she’s never actually seen because he can make himself invisible. Erik takes her to his palace in an idyllic kingdom, and she is swept into the beauty and culture of his world, but his affection has one condition: she may not see him. Enchanted, intrigued, and not wholeheartedly believing he’s real, Psyche can’t bring herself to love him blindly. When she betrays his trust for a glimpse of his face, Psyche ends up at the mercy of Erik’s controlling mother, who demands that Psyche prove herself in order to be reunited with him. Psyche knows love is never easy, but this is ridiculous. She agrees to complete three impossible tasks to prove her devotion to Erik—or die trying. I really like Aimee Carter's retelling. I loved Cinder by Marissa Meyer! I love the London Fairytale series by Rachel Van Dyken! HEART'S BLOOD by Juliet Marillier - inspired by BEAUTY AND THE BEAST. Beastly, i liked this book. My favorite is Beauty by Robin McKinley. The Goose Girl by Shannon Hale! I have always loved Ever After with Drew Barrymore (movie) another one is Beastly- loved that one too!!! Thanks!! I like Splintered, an Alice in Wonderland spin-off. I don't have a favoite but I love anything Beauty and the Beast or Rapunzle! Entwined is beautiful, Enchanted by Alethea Kontis is one that I fell head over hills for. A new favorite is Splintered. I love that the world of Wonderland has been turned on its head and shaken around really hard, stirred a little bit, with a hookah on top! I just finished reading Beastly by Alex Flinn and loved it! Cinder and Scarlet by Marissa Meyer. Beastly by Alex Flinn and Cinder by Marissa Meyer. I love fairy tales. I actually wrote a paper for my Literary Non-Fiction class about the resurgence of fairy tales in popular culture. This was last year when the two movies based on "Snow White" came out along with the tv show "Once Upon a Time…" and then "Cinder" came out. It was quite an explosion of fairy tales in mediums. I concluded that because of the rough economic times, people were grasping for something to escape to. In fairy tales, the impossible happens. The disenfranchised become the heroes and heroines. They rise to power and usually become a King or Queen. We are still clinging to the American dream and through the use of fairy tales we get to live that dream. As far as my favorite fairy tale goes, I love "Beauty and the Beast." I love it so much that I have thought seriously about naming my first daughter Belle. In books, I love retellings of fairy tales like "Cinder" and "Ella Enchanted." In TV, the show "Beauty and the Beast" on the CW is one of my favorites and in movies, I loved "Mirror, Mirror," "Beastly" and "The Wizard of Oz." Also, a big fan of the musical "Wicked." I have seen TV and movie retellings, but have not read any. I do have some on my kindle and this hop is motivating me to get started on them!